Chocolate Raspberry Tart for Two. Valentine’s Day is only a few days away. If you are looking for a romantic dessert this chocolate raspberry vegan tart for two is for you! It’s super easy to make, very rich and decadent, and the chocolate and raspberry flavors pair so well together. If you like desserts for two, you may also like my Chocolate Chip Cookies for Two. 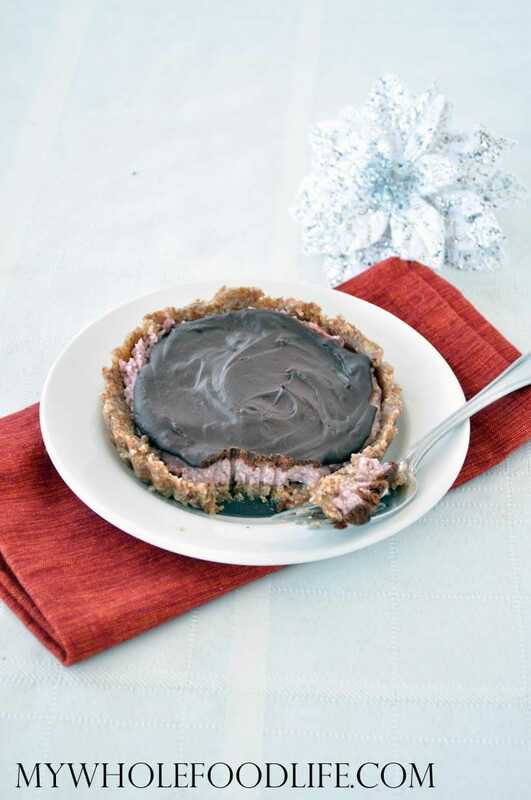 This Chocolate Raspberry Tart for Two is vegan, gluten free and even paleo friendly! All you need is 6 simple ingredients! If you don’t have a tart shell , I think you could also make this using standard sized muffin liners . If you need a nut free sub, you can use sunflower seeds in place of the pecans and a milk of your choice. 🙂 If you enjoy this post, you may also like this one. Looking for more tart recipes? Only 6 ingredients to make this festive Valentine's treat! In a food processor , combine the crust ingredients. Once it looks like it's clumping together, press the mixture into a 4 inch tart shell . I used 4 inch tart shells. Place in the fridge to set. While that is setting, combine the filling ingredients in a food processor and blend until smooth. Spread the filling on top of the shell and place back in the fridge. Using a double boiler method, melt the chocolate and the milk. Once it's smooth, spread it over the top of the tart and place in the fridge to set. Should take about 30 minutes. Enjoy! These look yummy and easy and with so few ingredients! I think you have another winner. Thanks! I love chocolate raspberry together. I can't wait to try this. I love your site and have pinned and made many, many recipes from you. Just this week I have run into a problem. When I try to pin your recipes I receive the notice from Pinterest "We have blocked this link because it may lead to spam". Has something changed about your blog that is restricting my ability to pin your recipes? I'm not running into this problem with the other food blogs that I follow. I never post replies but thought this may be helpful to you if others are experiencing this new challenge with your site as well. I'm hoping this is easily remedied. Thanks!!! Hi Heather! My account accidentally got flagged as spam on Pinterest. It's happening to a lot of bloggers lately. I have put 3 emails into them and I am waiting for them to fix it. :( Thanks for your patience! I am so sorry. Love this as well as all your other recipes. My hubby can't eat dates, so I wondered if you have any substitutes I could use. How about figs or apricots? I love your recipes but it seems as though Pinterest has blocked all of them! Hope you are able to get this resolved. Hi Cheryl! My account accidentally got flagged as spam on Pinterest. It's happening to a lot of bloggers lately. I have put 3 emails into them and I am waiting for them to fix it. :( Thanks for your patience! Thank you! I am not sure coconut oil will work in this.